I was speaking to a friend the other week about his relationship with his boss and how he always tells him what to do. This made me think about my first management courses back at Ingres. Because we had so many people straight out of Berkeley, few people were trained as managers and most had no role models to emulate. In this first course, we were presented the concepts of Theory X and Theory Y. 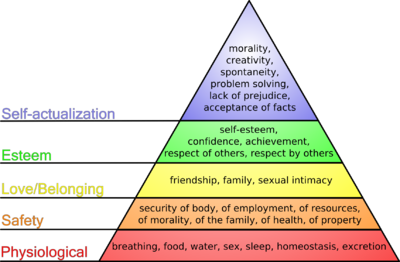 Although we weren’t told the history behind these theories, they were developed in the 1960’s and based upon Maslow’s hierarchy of needs. Theory X is about taking a pessimistic view of employees and don’t trust them. Theory X managers generally take an authoritarian stance with their employees and work better in control-oriented organizations. Theory Y states that employees may be striving for the higher level of Maslow’s hierarchy and searching for creativity and problem solving. Theory Y managers provide encouragement and trust for employees fulfilment. The end of the management course suggested that we as new managers should seek to balance between the two. Apparently, this is now considered a very old fashioned view of management and has been incorporated into other theories. What dawned on me after my conversation with my friend was that this describes the difference in attitudes between closed and open source. Control over the source code and intellectual property is very Theory X. I constantly get questions about how can you trust giving out the source code. Theory Y describes very much the motivations behind open source and those that contribute code and make their code openly available to others. I have read that what motivates most contributors is not any zealotry, but a desire to be recognized by their peers and to express themselves creatively in communal problem solving. This fits neatly into the higher levels of Maslow’s hierarchy. The open source process is becoming more mainstream in the economy as a whole. Open collaboration between employees, customers and partners yields more results when you are not worried about holding back information. In fact, I have found the whole process incredibly liberating. Perhaps it is worth looking at these theories again and recognize that we are shifting to Theory Y just as we are shift to more right-brain approaches. Maybe we need a Theory O for Open Source. This is interesting to me. I guess it. At some point last year I was thinking out loud on our wiki about similar things related to community (http://wiki.alfresco.com/wiki/Article_on_Community#Basic_Needs_.28Biolocal_needs) I'm looking forward to completing my current project so I can spend more time thinking about these kinds of things. I think this blog (and a few others) play a role in both the needs of the community and as part of the business model -- It informs and that helps create a sense of safety and to some extend a sense of belonging. Not many companies have executives that blog but I find it to be a very effective tool. There are a few powerful emotions that open source and similar culture invoke: sense of inventor or ownership, and a sense of belonging. Transparency and inclusion have a lot to do with it. Simple things like this blog go a long way in that capacity (IMO.) What more can you ask for than market has a sense of ownership and belonging to your products/community? A few traditional businesses have been able to invoke these emotions in their markets but I think open source is better equipped to do it.